My first week on the Whole30 has been pretty good! I’ll give a full update but I wanted to share this AMAZING recipe asap. Everyone should make this, whether you’re doing Whole30 or not. Seriously. I snagged this one from Megoirs (who adapted it from another blogger). It will definitely be a regular in my cooking rotation. I have a couple extra notes, which may help or may not! Happy cooking! 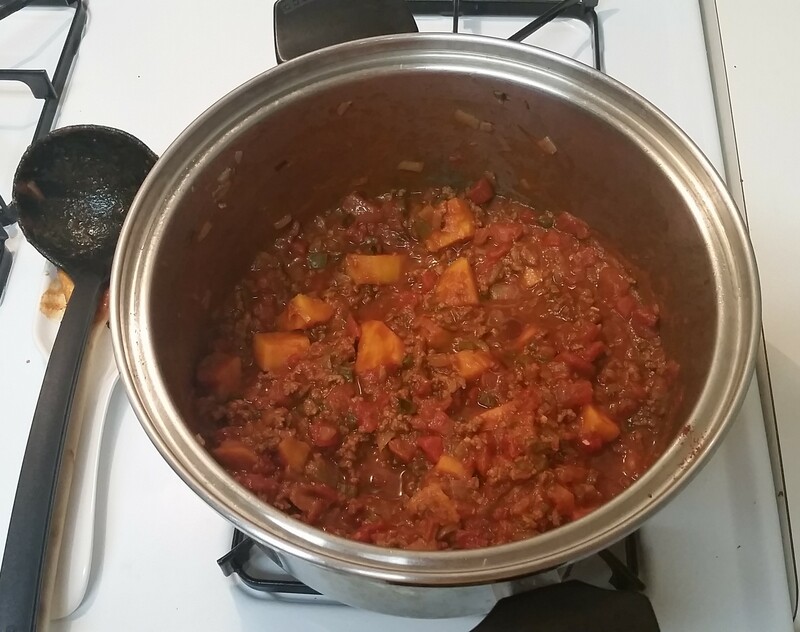 *my interpretation of large chunks then took an extra hour to cook in the chili. unless you like crunchy potatoes, I recommend small chunks so they will cook quicker. You still may need to cook a little longer than the recommended time. **I did not use cilantro. Confession: I hate buying fresh herbs because most recipes use just a tiny bit and the rest goes bad. But it can only be even better with the cilantro! Heat butter or oil in a large saucepan. Add the onion, garlic and peppers. Saute over a medium heat for five minutes. Add the meat, breaking it up with a wooden spoon, and sprinkle in the cumin and paprika. Let the meat cook until browned, and then stir in the tomato paste. Add the rotel, tomatoes, and potato into the pan. Stir well, then slowly add broth. Bring to a boil then reduce the heat. Let it simmer for 25 minutes, stirring occasionally. Add 3/4 of the cilantro and simmer for a further five minutes. Sprinkle in the rest of the cilantro immediately before serving. Categories: Spirited Saturday, Whole30 | Tags: chili, cooking, recipes, Whole30 | Permalink. Yum! I want this. I am totally making it next week.